How do today's most successful tech companies--Amazon, Google, Facebook, Netflix, Tesla--design, develop, and deploy the products that have earned the love of literally billions of people around the world? Perhaps surprisingly, they do it very differently than the vast majority of tech companies. 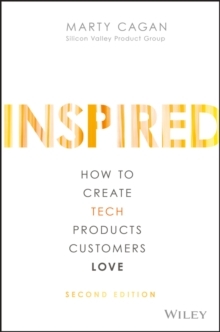 In INSPIRED, technology product management thought leader Marty Cagan provides readers with a master class in how to structure and staff a vibrant and successful product organization, and how to discover and deliver technology products that your customers will love--and that will work for your business. With sections on assembling the right people and skillsets, discovering the right product, embracing an effective yet lightweight process, and creating a strong product culture, readers can take the information they learn and immediately leverage it within their own organizations--dramatically improving their own product efforts. Whether you're an early stage startup working to get to product/market fit, or a growth-stage company working to scale your product organization, or a large, long-established company trying to regain your ability to consistently deliver new value for your customers, INSPIRED will take you and your product organization to a new level of customer engagement, consistent innovation, and business success. Filled with the author's own personal stories--and profiles of some of today's most-successful product managers and technology-powered product companies, including Adobe, Apple, BBC, Google, Microsoft, and Netflix--INSPIRED will show you how to turn up the dial of your own product efforts, creating technology products your customers love. The first edition of INSPIRED, published ten years ago, established itself as the primary reference for technology product managers, and can be found on the shelves of nearly every successful technology product company worldwide. This thoroughly updated second edition shares the same objective of being the most valuable resource for technology product managers, yet it is completely new--sharing the latest practices and techniques of today's most-successful tech product companies, and the men and women behind every great product.